For our first post-holiday showcase, we have some amazing words from the comedic genius you all know and love, the great D.C. Pierson. This cat is not only responsible for some of the earliest bits of hilarity that the internet had to provide, but he was a huge part of what will go down in history as one of the finest sketch comedy groups in history with his involvement in the legendary Derrick Comedy troupe. And since those early days, D.C. has managed to keep himself very busy as he continuously creates amazing content for the screen, as well as putting out an original book of his own. Pierson is a man with a mind that just won’t quit, and we are all so fortunate that he continues to share the insanity that lives within his brain to the rest of us. He is a hell of a nice guy, and we are very honored that he has agreed to become a part of the TWS family. So without further ado, please enjoy some brilliant words from the legendary D.C. Pierson! When did you first become interested in sketch comedy as a specific type of art form? Did you always feel that you would have the knack for it? I had liked SNL a lot as a kid, like most Americans who eventually get into comedy. Then in high school our family got HBO and reruns of Mr. Show turned up really late at night. Then when I got to college the sketch group I joined aspired to do sketches with Mr. Show-style transitions (which were kinda Monty Python transitions, something else I’d been really into growing up) instead of blackouts so I kind of felt like “Awesome, these people know about and aspire to emulate this thing I kinda thought only I know about,” which was really exciting. I have had the pleasure of speaking with several past and current members of the UCB world, and as a fan I understand what is so great about it from the viewer’s perspective. But, I always want to know how the player’s feel. What makes working with UCB a great experience for you personally? Is it all work and no play behind the scenes, or are you enjoying yourself as much as it seems? UCB has grown so much and there are so many facets to it that I can’t speak to the whole experience with any degree of authority. For me personally it’s all play and no work because I go do an improv show there every week that requires zero preparation and we are lucky to have a consistent audience. There are also unpaid interns, managers, teachers, artistic directors, people writing and putting up scripted material, or hustling to attract audiences and industry to their shows, all of whom are doing a ton more work than me. I’ve filled several of those roles in the past but my current position has more to do with when I got into the UCB community and how small it was back then. I was very lucky in that respect. It’s so much bigger now and institutions change as they grow. What can you tell us about the origins of Derrick Comedy? And what was the writing process like for these amazing digital shorts? Donald, Dom, Dan, Meggie and myself were all part of the larger college sketch group I mentioned earlier (Hammerkatz). We didn’t have a formal writing process, it would be more like a bit would develop just in the course of us hanging out and it would stick around long enough to be remembered the next time we were going to take a weekend (as long as we still felt like it actually had legs as a sketch) and shoot a batch of sketches and then we’d say “Okay, that makes the shoot” and someone would script it, and there would definitely be feedback from everybody and it would get developed further on its feet. What were those early days like becoming stars of the Youtube universe? And what are your thoughts on the progression, or regression, of the world of online media today? It was very cool. 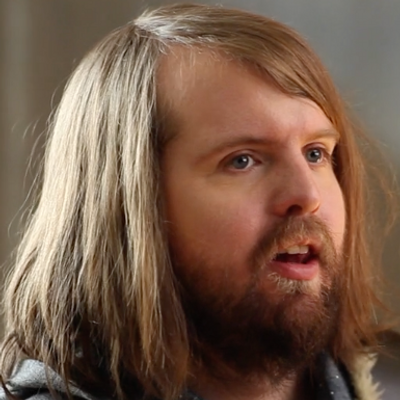 YouTube was very new — that’s why we had “Comedy” in the name, there wasn’t a lot of scripted content up so we felt like we needed to demarcate it as “HEY, THIS IS SOMETHING PEOPLE MADE ON PURPOSE.” As far as online media now, I know it’s a lot harder to break through than when we were starting. That was another bit of good fortune. We were trying to get good at making sketch videos for their own sake when they suddenly became a commodity. As far as shooting perspective goes, what would you say was the most entertaining and fulfilling video you worked on during your time with Derrick Comedy? I think most of us would say New Bike. It sort of felt like a stylistic evolution for us, and was a lot more filmic, and wasn’t really a first beat / second beat / third beat / blackout kind of sketch. You are also an acclaimed author with two books and several short stories, one book I am told is a must read, from people I trust, for these modern times is The Boy Who Couldn’t Sleep and Never Had To. For those of us who have made poor judgements and have missed out on this modern classic, what can you tell us about it? Why should we checked it out already? It’s cool that you’ve heard that! 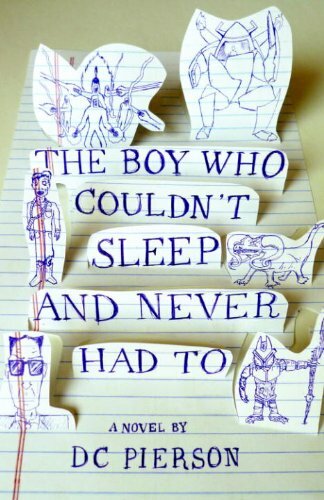 The Boy Who Couldn’t Sleep And Never Had To is a coming of age sci fi adventure about two kids in suburbia who are working on a homemade comic book when one kid reveals to the other kid that he has no biological need for sleep. When they push further, they discover that as a byproduct of this not needing sleep, he can actually bring things from their comic book into real life. Action, comedy, and growing up ensue. Nothing to plug really. Continuing to work on screenwriting projects with Dan and Meggie and new literary stuff on my own. My twitter is @dcpierson and if you grew up in a similar pop cultural universe to mine you may enjoy the dumb jokes I do there. I’m listening to a box set called Love Is The Song We Sing: San Francisco Nuggets that is a collection of 60’s era rock singles that capture the bay area music scene at the time. The music’s obviously great and the accompanying liner notes are really interesting. It was a unique and special time.